Watching the split-screen coverage in Ferguson, Missouri, last night demonstrated how far apart justice can be from the law. On one side of the TV, St. Louis County Prosecutor Robert McCulloch explained how he failed to get an indictment in the case of a white police officer shooting and killing an unarmed black teenager. On the other side, images showed angry protesters shouting at militarized police, and showed looters throwing bricks through windows and setting cars and buildings on fire. No one can honestly describe the scene as justice. Even if the law was followed, there is still a dead teenager and a racially-divided city. Justice cannot be found just in laws. And that was precisely the mistake in McCulloch's tone-deaf remarks. Even if the findings he presented were correct, he could have presented them in a more appropriate and effective manner. Yet, he seemed to mistake the legalese as the voice of justice. Surely he knew his words would impact people. 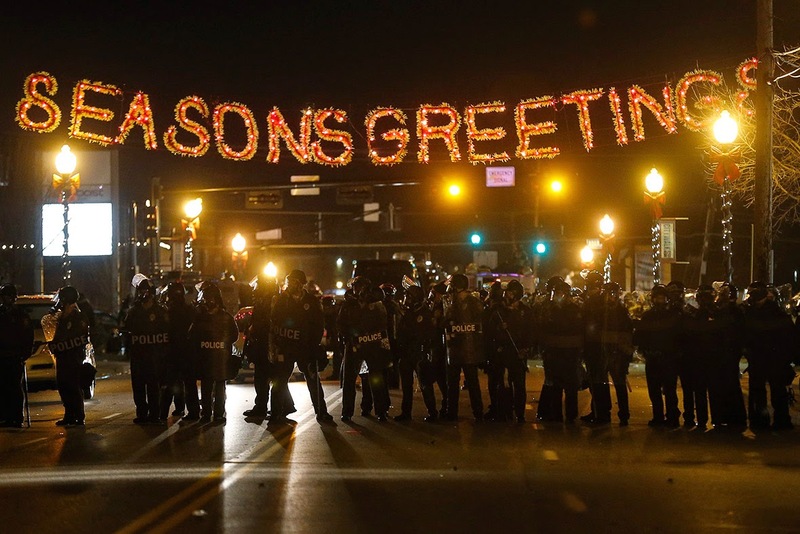 As I watched the images flickering next to McCullough, I marveled at the irony that Ferguson already had a large "Season's Greetings" sign up. It created quite a powerful visual metaphor as militarized police gathered under it. Could this be the mythical "war on Christmas"? The cynic in me believes McCulloch wanted the split screen scenes that we saw last night, that he wanted angry looters to burn the city down. Why else would he wait several hours to announce the grand jury decision until hundreds of people had time to gather? And why else would he announce the explosive news at night, which made it harder for police to keep order? It seems he wanted the violence in the streets so those scenes would dominant the news. Thus, his failure to get an indictment would not remain the focus of attention. Former New York State Chief Judge Sol Wachtler famously claimed if a prosecutor wanted, they could get a a grand jury to "indict a ham sandwich." He was just barely joking since it remains incredibly rare for a grand jury not to offer an indictment (far less than 1 percent failure rate in federal cases). The bar for indictment remains - correctly - much lower than a guilty verdict in a trial. The question is not if one is guilty but rather if their innocence or guilt should be carefully considered. If conflicting evidence (including conflicting eyewitness accounts) emerges, then a trial should sort through the case. Yet, even as McCulloch justified the non-indictment, he noted conflicting evidence and witness accounts. Additionally, poor police procedures at the crime scene should warrant further scrutiny in a trial. Turns out, this is the fifth time McCulloch failed to garner an indictment - out of five cases - in a case where a police officer shot someone. He did not even ask the grand jury to indict Officer Darren Wilson in this case. So McCulloch got exactly what he asked for, exactly what he appeared to want. He may have stayed within his legal rights, but we dare not call that "justice" - especially not as we enter into this season of reflecting about true justice. 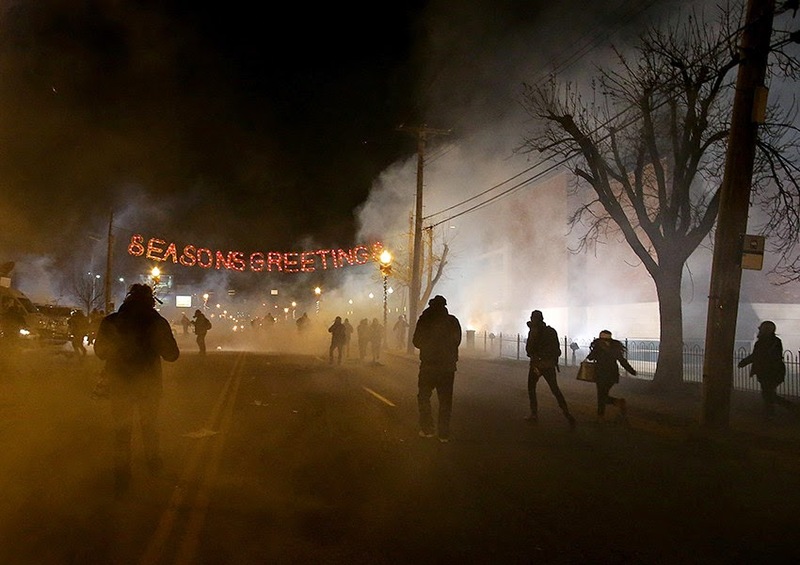 Shortly after McCulloch finally finished his long remarks, scenes of tear gas filled the air. Although tear gas remains banned from use in war as a chemical weapon, police use it on civilians. As it poisons the air, it attacks not only looters but also peaceful protesters and journalists. As long as tear gas floats through our cities, we dare not call that "justice." The looters who destroyed businesses and cars cannot claim to desire justice. An injustice in a courtroom does not justify injustice in the streets. Even a church building - the one where Michael Brown's father was baptized on Sunday - burned. Senseless, hateful violence. Most who gathered to protest the grand jury decision were peaceful, but the images of the violent ones dominate the news and undermine the messages of protest. The looters hurt their own desire for justice and play right into the hands of the prosecutor. As long as people turn to violence to voice their frustrations, we dare not call that "justice." Perhaps other legal avenues will occur in the future - such as a federal case or a civil case - but none of those are likely to bring real justice. Even if the grand jury had decided to indict, that would not have necessarily meant justice. But it would have at least signaled a step in the right direction. Instead McCulloch added fuel to the fire by confirming fears that justice would never have a chance. Even if Wilson deserved an acquittal in a trial, there should have at least been a fair trial. Not even indicting suggests the system does not really care. As long as many people feel the system does not actually value their lives, we dare not call that "justice." 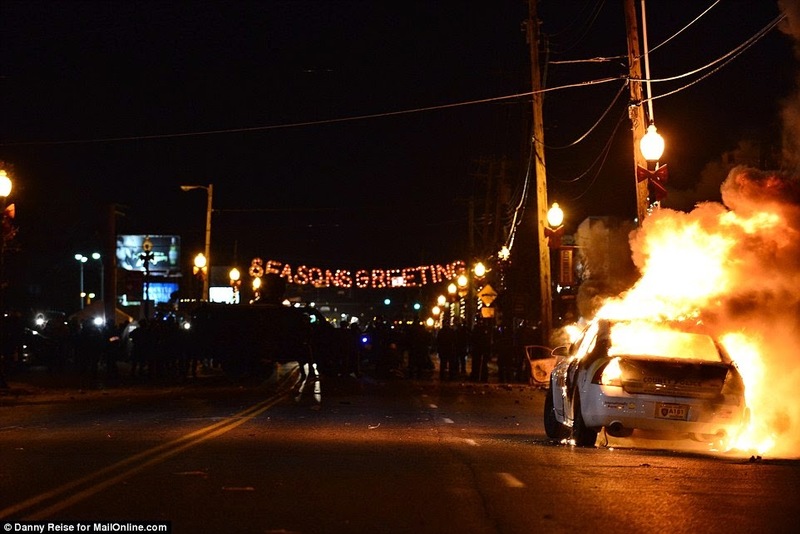 Perhaps the "Season's Greetings" sign sits there like a prophetic message reminding us that what we are seeing is not right. Simon & Garfunkel sang that "The words of the prophets are written on the subway walls." Perhaps in this case, the words lit up over the street to offer a counter message to the images of militarized police, tear gas, and looting. The sign haunts us by its presence in the midst violence and injustice. It shouts out that despite what the area's prosecutor may think, justice has not arrived. So we must wait in longing anticipation, which is exactly the point of the season of Advent.